This story was published by Glacier Reporter, written by John McGill, on Friday, May 22, 2009 1:13 PM MDT. Reposted with permission. "The Boys and Girls Club of the Blackfeet Nation started a partnership with National Relief Charities last December," said club director Tony Wagner. "We had worked together in the past, but this is an official relationship." National Relief Charities (NRC) works with some 900 program partners on more than 75 reservations. 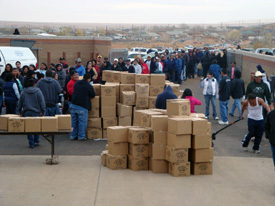 They have a number of assistance programs and donated items available for a large variety of purposes, and they tailor each program to the reservation group distributing the goods and services. Wagner explained that NRC has been serving Native Americans for 20 years, and that the organization exists to be a resource for reservation programs. "We are a nonprofit that exists to help support positive change and quality of life for Native Americans on remote reservations," said Helen Oliff of NRC. "We also work to educate and inform the general public about conditions on the reservations, in the hopes that more folks will want to make a difference. We work primarily in rural and remote areas — on over 75 reservations altogether. About 26 of them are in the Northern Plains, and the rest are in the Southwest. We currently work with about 900 programs, including the Boys and Girls Club and other programs on Blackfeet." Wagner said the local Boys and Girls Club is accepting three programs from NRC, bulk distribution, incentives and special events. "In the incentive program we get items that we can give out as prizes. Kids earn points in Boys and Girls Club activities, and at the end of the month they can redeem them for the prizes." NRC sends out such diverse items as glitter, eyeliner, all weather jackets, scissors, shoes, boots, pencils, caps and so on. "It depends on what they get," said Wagner. In the bulk distribution program, Wagner said they receive clothing and household items; then the Boys and Girls Club becomes the bulk distribution center. "We must advertise and get volunteers to unload the truck and break the cartons down into individual packages, and then more to distribute. It's just for people who need it, basically. We're just going to go with whatever and get it out into the community." The distribution takes place at 4:30 p.m. Tuesday, Feb. 17, at the Boys and Girls Club of the Blackfeet Nation in Browning. Individuals will receive four packages of fabric softener, a package of napkins, one of paper plates and four healing creams. In addition, individuals may help themselves to household products and any clothes they may need. It's estimated the Club can serve 120 people at one per family. The next day, Wednesday, Feb. 18, the Boys and Girls Club is distributing shampoo, conditioner, soap and lotions to the kids at the Blackfeet Boarding Dormitory, with 108 kids receiving one of each. In the special events program, the Club is teaming up with Dee Hall of Blackfeet Community College to participate in BCC's annual spring Health Fair. The NRC will contribute health-related items to give out at the conference. "You explain your event to the NRC, give them your information and find out what they have to help and choose what works best," said Wagner. Rather than work with governments, NRC works directly with local organizations to accomplish its task. "We believe the people who live and work on the reservations know the people and the needs better than we do, so we work through them to support the goals of their programs," Oliff said. "We look at the partner's goals and figure out which of our programs could best support them. We have a program to fit just about any reservation program. The Incentives program is particularly important because it provides positive incentives for positive behaviors — and reservation programs decide what behaviors they want to motivate." For more information on NRC programs, go to http://www.nativepartnership.org or call (605) 399-9905.